I finally have a finished knit to share! It feels like it’s been a while since I had one of those. This is Driftwood, a giant triangle made out of the best. Yarn. Ever. It’s Blue Moon BFL Sport, and it is sooo dreamy. It’s a lovely woolen-spun two-ply, which gives it the best squoosh and airiness. It’s a little sheepier than merino, for sure, but I still have no problems wearing it around my neck. 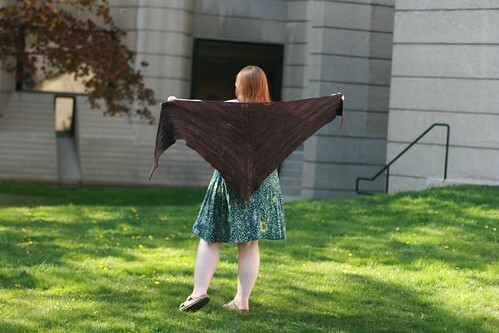 It comes in huuuuge, 250g megaskeins, so one was all I needed for this shawl. 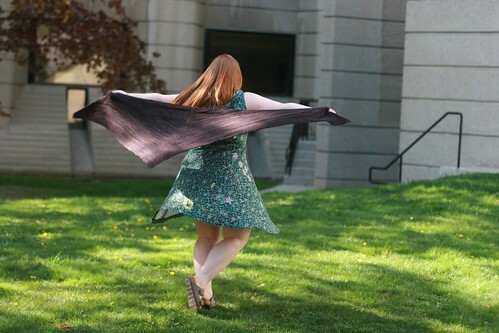 The colourway is called “Valkyrie,” which is a lovely deep purple with orange and purple notes. I was watching a lot of Lost Girl when I cast on, so I’ve been calling it my Tamsin shawl, after my favourite valkyrie from that series. 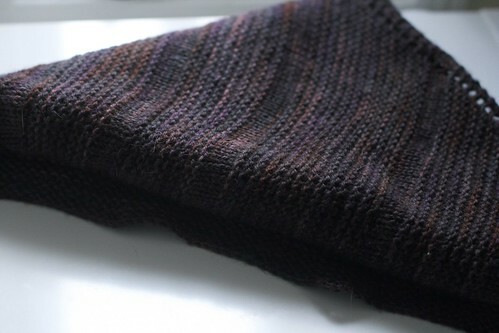 The pattern itself is pretty straightforward – it’s one of those variations on a triangle, but the alternating garter stitch and stockinette sections give it a little interest. I added a bit of extra length, because I wanted to finish off the skein entirely, and I love the finished size. This was a really meditative knit – I love having something in garter stitch on the go, to pick up whenever I’m in the mood for that. This is also a yarn that is absolutely begging to be garter stitch – it makes that squoosh factor even more pronounced. I kept telling my friends to pet my shawl while I was knitting it so that I could show off how cuddly it was going to be! It’s definitely a pretty huge finished piece – when I wrap it around my neck like a scarf, it is a Statement, for sure – but I sort of love it like that. I’ve got some travel coming up in the next little while, and it’ll be perfect for airplanes and car rides when I want to take a sneaky blanket with me. 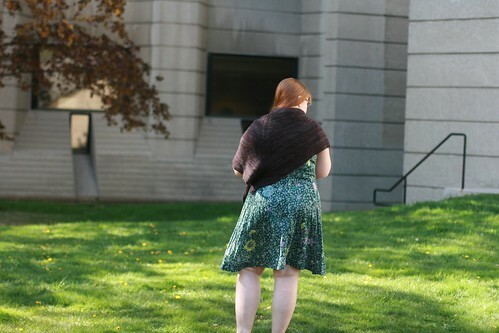 I love this shawl!! The colour looks incredible, and the whole thing looks so comfy and squishy!